Yes, it’s heading to that time again. 8 weeks until Christmas.. Who has their hair appointments organised? We urge those of you that have not got your holiday appointments sorted to do so, as we are almost full for the month of December, and we would hate for our followers and regular guests to miss out. Another great way to save this Christmas is with a Cobaarz gift voucher. For every $50 spent, we will give you a BONUS $10 in credit. This can be added to your gift voucher, or you can keep it for your own use. So $100 earns you a bonus $20, and so forth. Above everything else, please look out for yourself this Silly Season. Take some “you time”, and don’t let a happy and fun time become a stressful and horrible time! 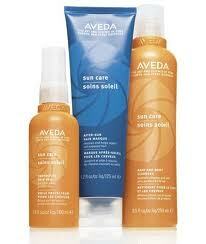 Aveda Sun Care Range- Nikki’s Road Test! We all know from our guests reviews that the Aveda Sun Care range rocks, but I have not been fortunate enough to spend enough time in the sun since it’s launch to give it a go myself! Remember, us hairstylists are like Vitamin D deprived vampires, remaining in the salon during daylight hours doing what we love. Sunshine is a rarity! I took the range with me on a holiday to Thailand for a week, hoping that it would save my hair from sun, sea, and chlorine. For those who don’t know me, my hair is very fine, and using Aveda colour has been lightened to a VERY LIGHT platinum blonde. If anyone’s hair is going to be a good test for this range, it’s mine! I found that the Sun Care Hair and Body Cleanser got rid of all chlorine, sunscreen residue, and salt very gently without making my hair feel at all raw, unlike most clarifying shampoos. I had to use it every day, as not a day went by that was not spent in the water at some point. Only a very small amount was needed. Natural corn derived chelators remove all the mineral and chlorine deposits without stripping the hair raw or drying out your skin, which is great! The After- Sun Hair Masque was just awesome. It left my hair soft and healthy, and really put back in what the sun took out. A small amount was left in for three to five minutes (like a regular conditioner). No more of that dry, brittle, rough feeling, just silky, smooth hair. Even I (an Aveda devotee!) was amazed! And with certified organic sunflower seed oil and green tea extract, it smells amazing. But I must say the HERO product of the range was the Sun Protective Veil. It basically acts as a water-resistant sunscreen and moisturiser for your hair. A micro-mist pump pack, it can be applied wet and/or dry (I did both!) and it keeps colour in, and the sun OUT. It lasts for 16 hours! Having such fine hair I was delighted that it was non-oily, added shine, and really did what it was supposed to do. Organic Palm oil and a light tropical aroma added to it’s appeal. I (somewhat reluctantly (; ) returned from Thailand with silky, healthy hair, that did NOT feel rough, weathered, or at all damaged. And I spent every day in the sun, pool or sea. My hair was not chlorine green, nor was it sun-bleached yellow but remained a very clean platinum blonde. It passed my brutal test- if this product does wonders on MY hair, it will be great on ANYONE’s.